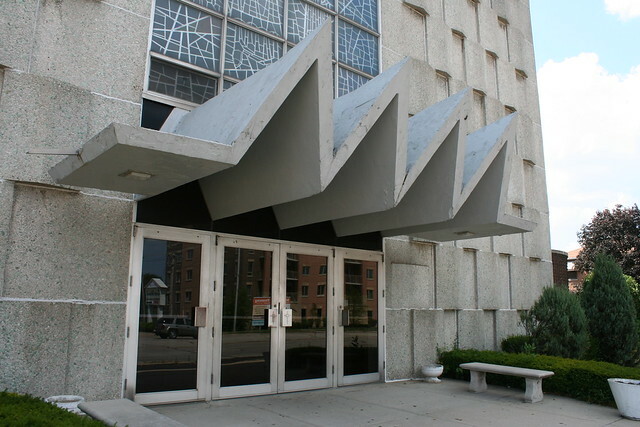 When I sat down to write this post, I discovered that I had no photographs of this church’s front facade (probably because crossing Wolf Road on foot to get them would entail taking my life into my hands.) 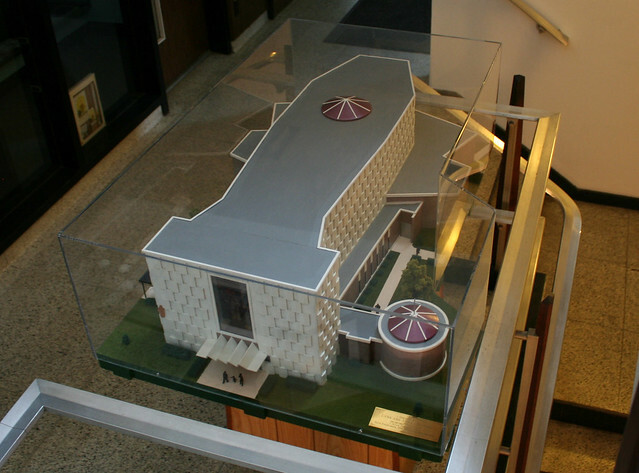 Fortunately, the Church fathers saw fit to leave this lovely model of the building on display inside it. 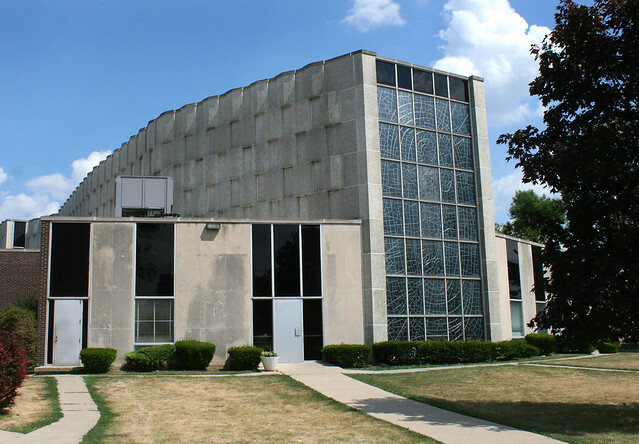 The building of St. John Vianney Church (46 N. Wolf Road, Northlake) was begun in 1962, to the designs of architect Joseph W. Bagnuolo (1908-1996). 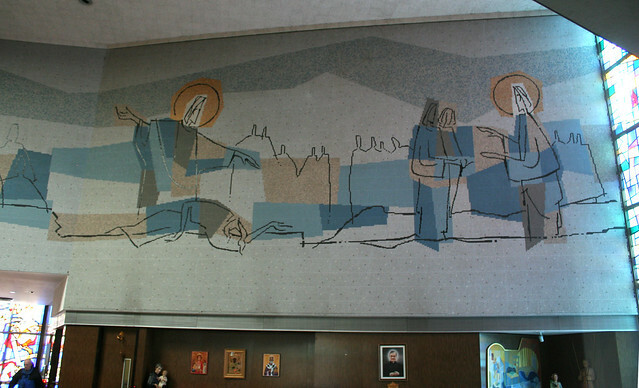 The firm would also design the tile murals within. Seen from the air, the building is shaped like a fish, a common Christian symbol. Concrete panels with aquamarine stone and quartz embedded in them act as “scales” to continue the metaphor. 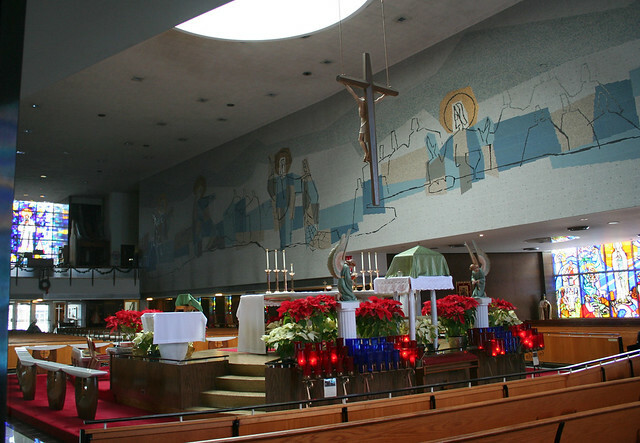 Inside, the sanctuary is an unbroken space, with side aisles separated by a sharp change in ceiling height. 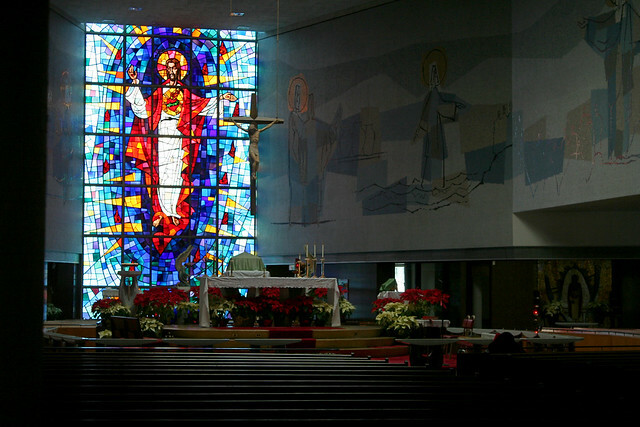 Two giant stained glass windows dominate each end of the sanctuary. 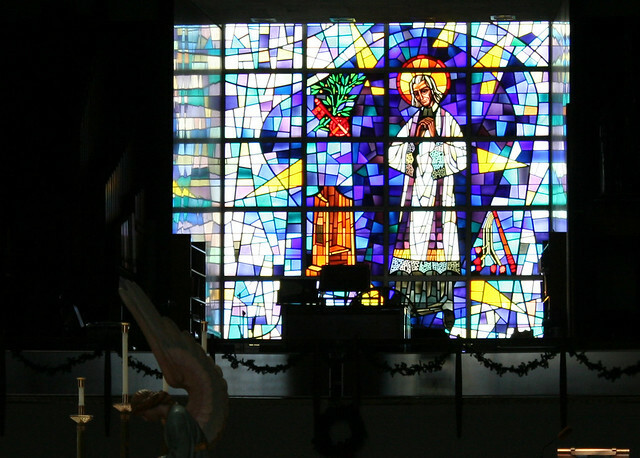 There are abstract faceted glass patterns on the side windows, but the bulk of the windows are flat glass. 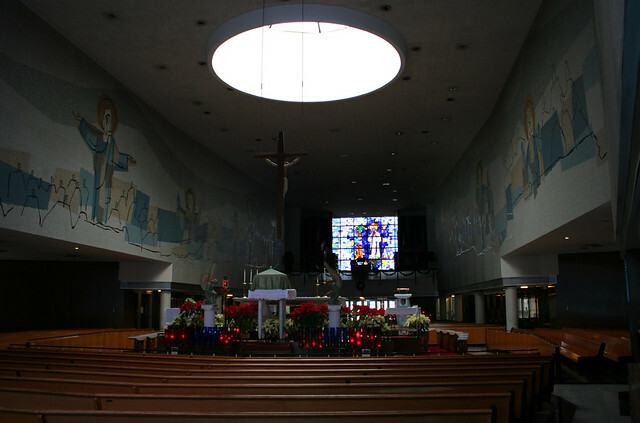 The altar is in the center of the sanctuary, illuminated from above by a round skylight. 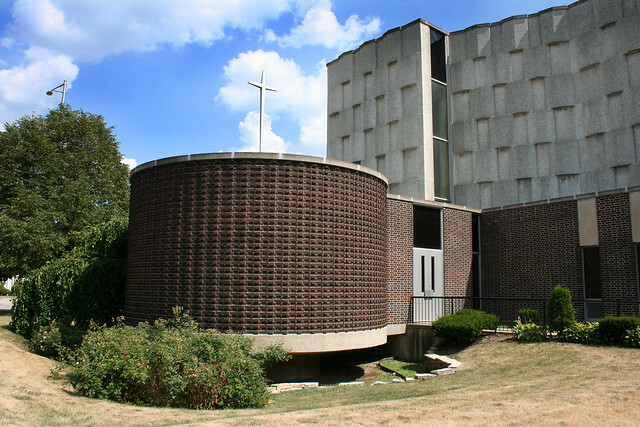 The design is a “church in the round” approach based on the post-Vatican II updates of the Catholic liturgy. 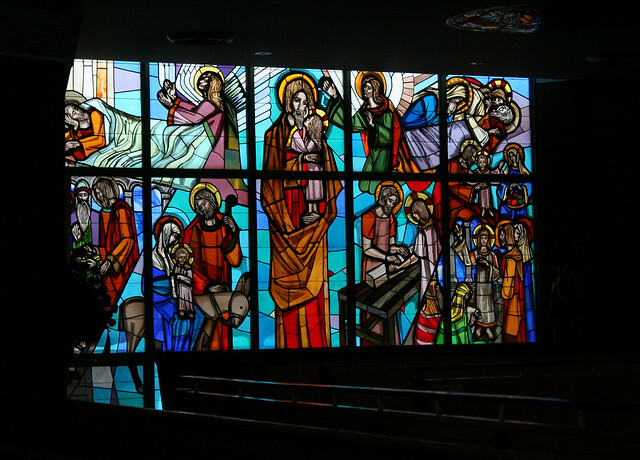 The walls carry 150-foot long tile mosaic murals, depicting seven sacraments, seven miracles, and the life of Christ. Details small and large enhance the period feel of this church. 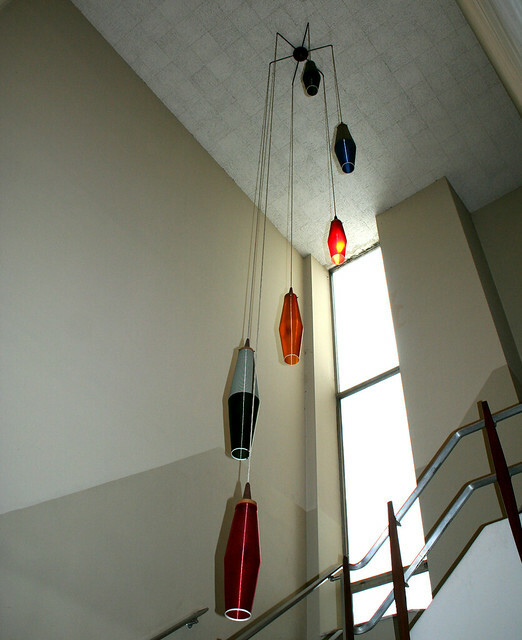 These elegant light fixtures give style and panache to an ordinary stairwell, and the handsome door paddles below are a grace note as one enters the building. 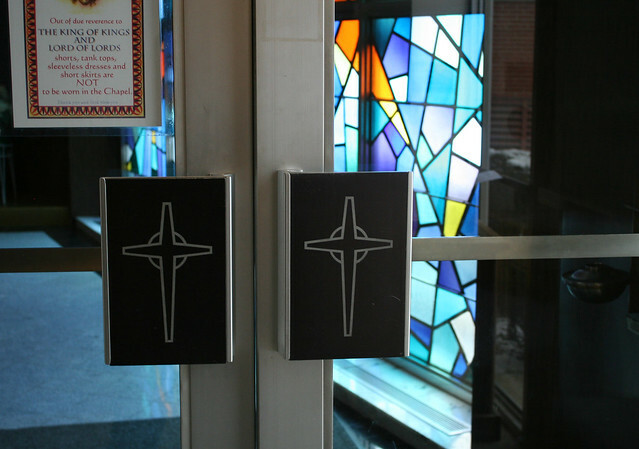 The baptistry is a separate round structure connected by a small hallway. 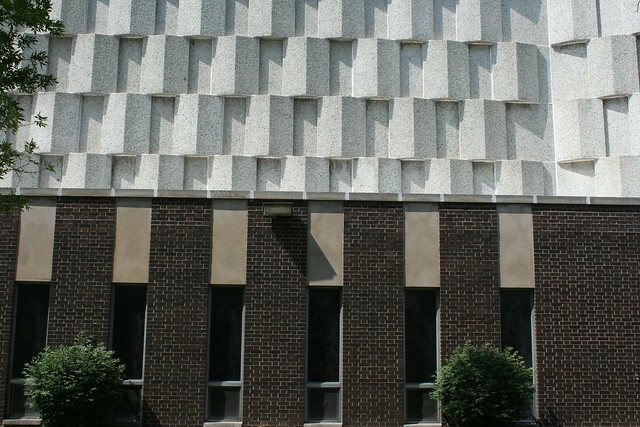 Articulated brick patterns give it an additional dose of 1960s pizazz.